New York City deserves an event focused on the art and action of rapier fencing. Featuring Piermarco Terminiello and Adam Franti, this year's event will continue to spotlight on private coaching and individual development. As the event matures, we aim to provide some of the best instruction available for this weapon. Please bring a mask, gloves, jacket, and rapier. Both SCA and HEMA standards for gear are acceptable for this event. Salvatore Fabris' art of fencing involves very specific body posturing in a manner that looks, at times, nearly impossible. From assertive forward leans to sideways lunges and cross-stepped footwork, Fabris can be hard to approach from a kinesthetic standpoint, and simple misunderstandings about the purpose and application of the guards turn many people toward rapier systems that appear to be less physically demanding or complicated. In reality, the postures themselves are built on fundamental kinesthetic properties that, once learned, are applicable not only to historical martial arts, but many banal physical activities in day to day life. We will cover how the hip hinge is critical to forming Fabris’ guards properly, how it distributes body weight and encourages cross-stepping, and how a fencer can use these simple physical concepts to fence dynamically, and canonically without unnecessary fatigue or strain on the joints or lower back. The class will focus on “waking up” the hips, and contextualize and practice the crossing and passing footwork advocated in Fabris primarily focusing on the sword alone. If time and interest permits, we may cover basic body posturing with sword and dagger or sword and cloak. While portions of the class will necessarily discuss tactical aspects of the system, the class is predominantly aimed at teaching healthy and sustainable body mechanics for fencers to apply to any system they wish to study. In addition to a rapier or sidesword trainer, light sparring gear is necessary, including a mask with back of the head protection, a gorget, a cup, light jacket and gloves. Early seventeenth-century Italian rapier is predicated upon dominating your opponents sword, constraining their viable options thus controlling the fight. This is achieved through “finding the sword” - gaining a mechanical advantage over their blade; a process that can be aided (or countered) through the judicious use of feints and disengages. The same principles can also applied out of measure – selecting a guard that simultaneously protects you, while finding the weaknesses in the opponent's guard, even before the swords are engaged, such that through a play of posture and counterposture, an entire fight can take place out of measure, with steel clashing only as the decisive lunge is released. This event is offering a sliding scale to make this event as accessible as possible. If none of these options work for you, please use the email above. On Being Lazy: Fencing with the single rapier can be a complex and tiring activity – closing the line, parrying, disengaging, lunging, etc. In this workshop, which is based on the works of Bruchius and l’Ange, we will explore how using posture and basic principles we can be as lazy as possible in our fencing. Another Dimension: A more advanced class looking at a single play in Bruchius, and exploring how this deviates from earlier styles. Fencing l’huomo bestiale: Typically we focus on using the Italian Rapier to fence another skilled swordsman, yet, more often than not, we are forced to use the rapier against ruffians and l’huomo bestiale (the bestial man). This workshop will focus on how to apply your fencing to deal with unpredictable sword slingers, vulgar fencers, and thugs. 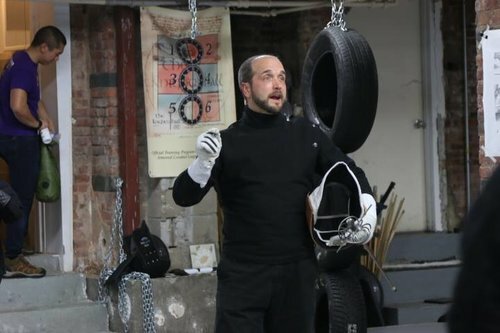 Introduction to Capo Ferro: In this class, a beginning fencer, or one unfamiliar with the teachings of Capo Ferro, will have a crash introduction to his style, culminating in a set of progressive drills that demonstrate the actions of plate seven. This class lays down the fundamentals and stylistic understanding that are needed to progress through the rest of the manual. Why does the Northern Italian style work? This class goes into depth on the actions of the Northern Italian system(s), explaining the tactics and strategies that are involved. This class looks at the style from a tournament mindset and lays out some ways that the system helps you succeed in full-speed engagements so you can better adapt the teachings to any situation at hand. Actions in tempo and contratempo: Kevin and David will teach a class on learning to recognize and exploit tempo, or opportunities for attack. The class will focus on simple attacks and will continue to actions in contratempo.